LENEXA — Running a 5K at race-pace is not easy. Especially after having undergone over 100 surgeries. But that hasn’t stopped St. James Academy senior Zoe Schierts from competing in four years’ worth of cross-country meets. “Zoe has run in every training session and raced in every competition with our team while she has been in high school,” said head coach Rob Harber. “[She] is one of the most hard-working people I’ve ever known,” he added. 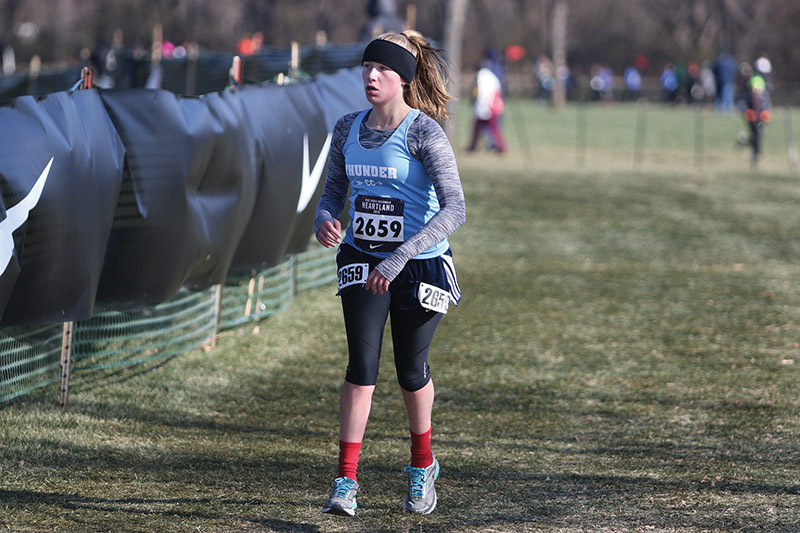 For most, joining the cross-country team means training for another sport or working toward a scholarship to college. But not for Schierts. “During summer training a few years ago, one of our coaches asked the check-in question: ‘Why do you run?’” said senior cross-country teammate Sarah LaPlante. “Zoe’s answer was because each day she runs is one more day she will stay mobile. Diagnosed with a form of cerebral palsy called “spastic displegia” as a child, Schierts’ muscles and bones are weakened by the disorder, particularly in her legs. In middle school, Schierts’ doctor began to push her to join St. James’ cross-country team. Her doctor also encouraged her to join cross-country for the social aspect. Despite her apprehension, Schierts joined the cross-country team and greatly improved during her career. She broke many personal records and ended on a high note, setting a new 5K (3.1 miles) personal-best time of 38:49.20 in her final race. The love of running was a learning process for Schierts, with her junior year the turning point. Schierts realized she had two options in approaching cross-country: either feel sorry for herself in her disability or do her absolute best despite her limitations. Despite being the last to finish every one of her races — and falling often — she chose the latter . . . over and over again. From that point on, Schierts became a visible leader on the team — to the point of being chosen as a team captain by her teammates this year. But for the team, Schierts was an obvious choice for captain. Today, Schierts and running are nearly inseparable. Running has taught Schierts, the team and coaches how to physically and spiritually accompany each other. “I used to run with Zoe a lot when she first started, just to give her somebody to run with,” said St. James cross-country coach Julie Becker. “Often, we would pray while we ran. Awareness of the pain of running as an opportunity to recognize Christ present has opened the whole team to the needs of others. And they look to Schierts as exemplary. “One thing we always do as a team and that I encourage others to do is to say Hail Marys or say prayers for somebody else who is really suffering,” said Schierts. “We have plenty of people who really need prayers,” she continued. “It reminds me that my pain is very small and insignificant compared with other people’s pain. The act of running has also renewed for Schierts the memory of her late mother, who passed away when Schierts was 9 years old. Next year, Schierts plans to study pre-physical therapy at the University of Central Missouri in Lee’s Summit. And, of course, she will keep on running. You are a super hero and an inspiration to all students. We saw you run. So proud of you. Keep up the good work. You are quite an inspiration. My absolutely powerful Girl! I love you Zoe!